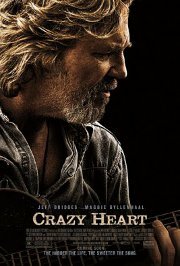 Jeff Bridges gives an Oscar-worthy performance is this tale of an over-the-hill country singer. He's 57, alcoholic and struggling to survive. An interview with a pretty young journalist leads to friendship, and things start looking up. His protege, now more famous than him, also tries to help, but he is so set in his ways that change is difficult. Nevertheless they persevere, and the chance to write a new song helps settle things down. Comments A sensitive uplifting film in the end.